Minister Alan Kelly T.D., Minister for the Environment, Community and Local Government has formally launched the national roll out of the Smart Technology Energy Saving Scheme. The national energy saving scheme will see 10,000 homes across Ireland fitted with a climote remote control heating system to enable families take full control of the energy used in their homes. Delivered by home technology company climote, and funded by Electric Ireland, the Smart Technology Energy Saving Scheme is a groundbreaking initiative which sees the collaboration of the public and private sectors in delivering an innovative energy efficient scheme based on the use of smart technology. climote beat off competition from a number of other international connected home technology companies to secure the deal which will be run in partnership with Ireland’s largest energy supplier Electric Ireland. The scheme will see 10,000 homes fitted with a climote hub over the next twelve months. At no cost to the exchequer or individual local authorities, 10,000 local authority and housing association homes will be fitted with a climote which will allow homeowners to control their heating timings and temperature via a smartphone, text message or online. This type of life changing technology has been proven to reduce energy consumption by an average of up to 20% every year. “The roll out of the national energy saving scheme will be carried out by the nationwide team of approved climote installers who will install the 10,000 climote hubs in local authority and housing association homes over the next 12 months. We have targeted local authority houses and housing associations so families can benefit from climote’s energy saving technology” continued Eamon Conway, Managing Director of climote. 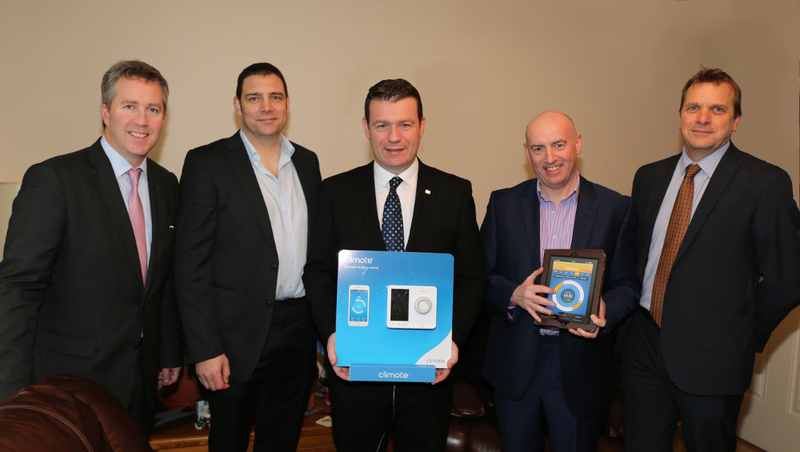 The Smart Technology Energy Saving Scheme was launched by Minister for the Environment Alan Kelly T.D. in the home of one of the early recipients Trish Foran in Ballygraigue Estate, Nenagh, Co Tipperary. Minister Kelly was joined by representatives from climote, Electric Ireland and Cluid Housing, the largest housing association in Ireland. A number of Local Authorities and housing associations including Laois County Council, Louth County Council, Kerry County Council, Mayo County Council and Cluid Housing, have already agreed to participate in this free scheme and have their housing stock fitted with a climote as part of this Energy Saving Scheme. climote is the brainchild of ex-Honeywell executive Eamon Conway and home technology innovator Derek Roddy, who provide a wealth of knowledge and experience in the smart heating space. The duo have created a company focused on innovation in the areas of energy and home technology. The climote device enables users to control their home heating and adjust the temperature from anywhere in the world, using smart technology. This national scheme of 10,000 homes further enhances climote’s reputation as a leader in the home technology and energy sector across Ireland and the UK. The fast growing company has already seen energy sector leaders such as John Mullins and Ian Marchant, ex CEO’s of Bord Gáis and SSE respectively, join the advisory board and invest in climote, while the Dundalk headquartered firm won a global tender to offer their remote control heating system to Scottish Power’s 5.6m customers throughout the UK.